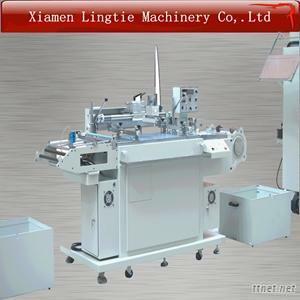 Xiamen Lingtie Machinery Co., Ltd.
China (mainland) Fujian Xiamen,No. 101, Xitang Toad, Tong'An Dist. 1,Our machine adopt the best CNC built-in computer control system, running stability high precision, long life, high speed responsibility, high torque. 2,Magic eye imports from Germany, the sensor precision is adjustable and it is good for color match and accurate register of printing. 3,Frequency converter & adjusting device adopts Mitsubishi brand (Japan) regulate speed electrically, which is featured by easy operation, steady rotation, safety and correctness. 4,The electronic counter can preciously control the carton quantity. 5,Photo sensor auto-detection system for no films. 6,The machine has QC lamps, easy to operate. 7,The suction air can be adjusted discretionarily and intermittently. The machine adopts suction ventilator and avoids any scratch on printing surface and keeps the constant tensile force. 8,Both side of squeegee can be used, and extend the useful time. 9,Work table adopts stainless steel, never rust, anti dumping design, safety and reasonable. 10,The machine adopts electrostatic painting and stoving varnish and solvent-resistance on the surface. 11,High quality fitting, ensure the printing precision and stable running. 12,By using wheel on the screen printing machine, easy to move and other humanity design. 13,Suit for printing large impression, fine words, mesh point, the products is clear, bright and don’t fade in color. 14,Ink good adhesion, ink layer thickness, don’t fade in color, no fade, and design stereo feeling good, bright in color. 15,High printing speed, replace the traditional manual, semiautomatic operation modes, improve the production efficiency more than six times. Only need one people to operate. 16,This machine can be connected to UV drier, die-cutting machine, slitting machine, rewinder etc. PVC,PET,PP,PC,PE,BOPP etc all kinds of films, various of nameplate for electronic appliances, membrane switches, panels, soft circuit board, IMD,IML,FPC,rubber vulcanization,heat transfer films, non-woven fabric, color labels for cars, water labeling, ceramic decals, thermal transfer paper, leather, electrostatic film, tetoron, coated paper, adhesive sticker and so on. The thinnest which it can be printing is 0.02 mm. 1,We have a rich experience,technical good,service awareness ahead of the professional team, can be timely and effective solve the problem for you. 2,Installation and debug machine for you without any charge.Also,giving a technical training for your employees. 3,All of our machines can have one year guarantee and lifelong maintenance. 4,We can also provide you with printing materials, printing ink and solvents and other raw materials.